I've been quite fascinated by eTextiles and wanted to try a project combining my love for sewing with electronics. Growing up I did a lot of sewing with my mother, including making my own clothes, cross stitch and tapestry projects. At Tech Age Kids we explore how tech is used in all sorts of creative ways, one of those being electronics in fabric crafts and fashion. eTextiles, is the process of using electronics in textiles to add function and / or decoration. It is also known as smart textiles, wearable fashion, eFashion or smart fabrics. The concept has actually been around for a while, as suggested in an article found from April 1884 published by The New York Times. Ballet-girls were adorned with electric lights in a stage performance. Today there are many exciting creations and useful developments in eTextiles. Simple examples are plush toys with push-button speakers, reflective clothing, I particularly like the use of eTextiles in fashion, such as collections by CuteCircuit, a London-based fashion house pushing the boundaries of wearable technology since 2004. The electronic components for eTextile projects are specifically designed for fabrics and sewing with conductive thread. You don't need to do soldering and need a very limited knowledge of electric circuits. Our project had three LEDs in parallel. 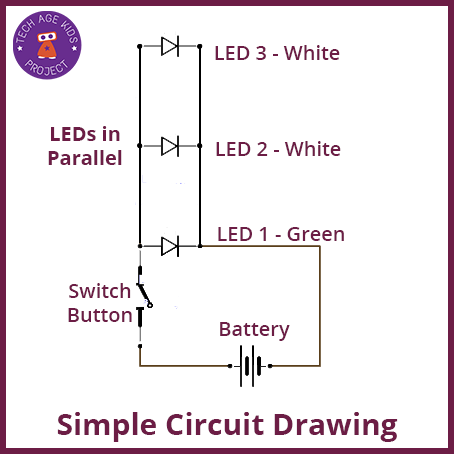 A parallel circuit is more tricky to sew than a circuit with a single LED. In fact, I ended up sewing the electronic parts of this projects with my teen. Below is a simple diagram of our circuit. I like the idea of teaching my boys sewing skills. So I recently introduced my 7 year old to french knitting and cross stitch. 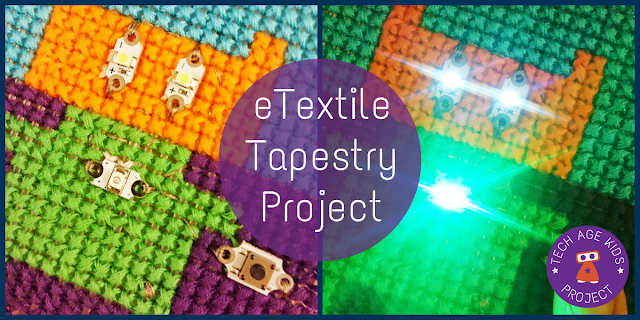 We designed an eTextile project using cross stitch and electronics circuits with LEDs - a cute robot with light-up eyes and a heart. Below is a list of all the materials we used for this project. Make your chosen design using the tapestry thread and plastic canvas using cross stitching. If you use a pixel art design it is fairly easy to work out on cross stitch. Next time, we'll use thin wool and only do half stitches, as my young son, found the cross stitch a bit tiresome. Next work out the electronics. We used our simple circuit drawing to help plan where to place the battery holder, button and where the conductive thread will go. Note the negative and positive sides of the circuit shouldn't touch. The two white LEDs were for the eyes and a green one for the "heart". Take extra care to check you line up all the negatives and positives. It's finally time to sew. 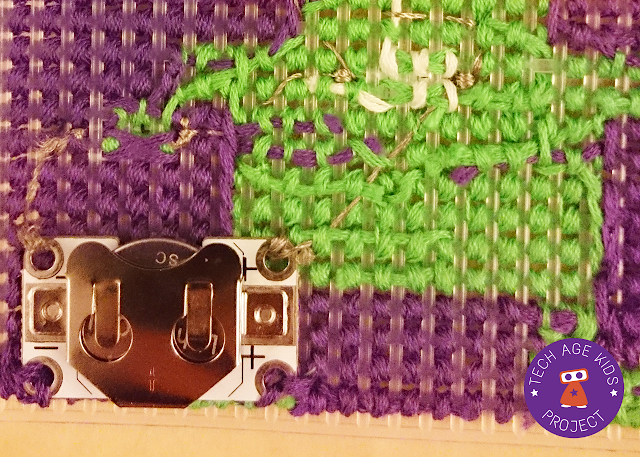 Use the conductive thread to secure the negative side of the battery holder using several over-stitches to make sure you have a good connection. Use a running stitch to the first LED's negative side and secure with several over-stitches. Continue to the second and then the third LEDs using running stitches in the same way. On the third LED cut your conductive thread. Start again on the positive side of the third LED, making sure your conductive thread doesn't touch any thread on the negative side. Using the running stitch make your way back to the battery passing the second and then the first LED, securing with over-stitches every time. Don't cross any stitch lines from the negative side. A button, such as in our project, adds a level of complexity. Ensure your conductive thread doesn't cross over from negative to positive sides. The battery and button are sewn in series and the LEDs in parallel. The use of a button and 3 LEDs made the project a lot more complicated and I ended up taking over from 7 year old. (I must admit, my teen's knowledge of parallel circuits, came in handy here!) In fact I was rather pleased my little venture turned into a whole family project. This was our first experiment with eTextiles and we really enjoyed the learning experience and skills gained. You can make much simpler projects and we will write more about eTextiles, sharing more of our projects and discoveries. The sewing of the tapestry was the most time consuming part of the project, but thoroughly therapeutic and enjoyable. You could consider using fine wool and half cross stitch to speed up the process. The plastic canvas is fantastic for kids, as it's easier to hold and sew your piece. It makes a sturdy base for sewing electronics too. 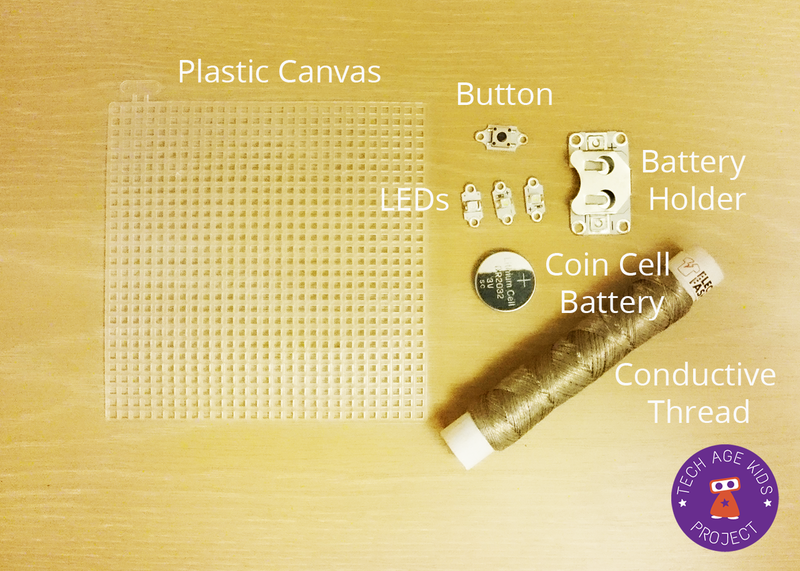 For younger children, try use a single LED without any switches, like a button, for a first time eTextiles project. This is perfect project for bigger kids, tweens or teens.